Picked from over 150 firms who submitted to the Foundation’s request for qualifications issued in August, the seven firms will now be asked to present designs to the President in the first quarter of 2016. If Adjaye or Piano are chosen, they will be the first foreign-based offices to design a presidential library. The selection of the perspective architects comes after a long selection process for the site of the library itself. Not without some controversy, the South Side locations were chosen out of possible sites in New York, Hawaii, and another in Chicago. 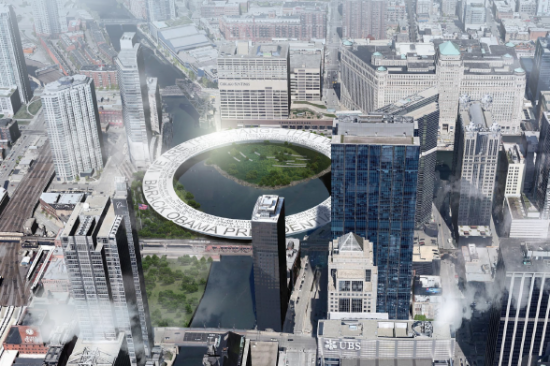 Public space advocates, Friends of the Parks, argued that the library, technically a private institution, should not be allowed to be built in the city’s public parks, an issue the current Lucas Museum is also dealing with. This was overcome with the help of a deal made by Mayor Rahm Emanuel which would transfer control of the land away from the park system. Each office will submit conceptual designs for both of the possible 20-acre South Side Chicago sites: one in Washington Park and one in Jackson Park. The $500 million project will include the presidential archive, a museum, and office space for the Obama Foundation. After reviewing the proposals, the Obama family and the foundation are expected to make a decision by summer 2016, the expected completion of the project being in 2020 or 2021. 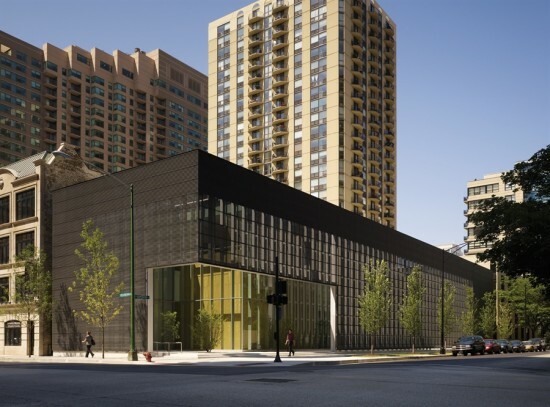 Although the decision had already been widely reported by May 1, Barack Obama‘s nonprofit foundation today announced that the 44th President's library will be built on the South Side of Chicago. "With a library and a foundation on the South Side of Chicago, not only will we be able to encourage and effect change locally, but what we can also do is attract the world to Chicago," said the President on the occasion. The official decision ends perhaps years of speculation about the location of the former University of Chicago law professor's legacy project. But it officially begins speculation on who will be the library's architect, and what the ultimate design will bring to the president's longtime home. While speculation around the Barack Obama Presidential Library continues to swirl, plans for one of the project's four potential sites just became a bit clearer. 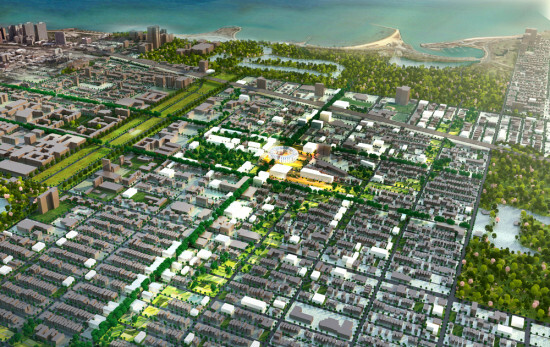 The University of Chicago, where the President taught law, made public this week new renderings and details of their bid for the nation's 14th such library, trotting out sunny images that show the economic development potential of investment in the South Side areas surrounding Washington Park. The University of Chicago is among four finalists selected to vie for the library, whose governing nonprofit is expected to deliver a decision later this year. (Hawaii, New York City, and the University of Illinois Chicago also submitted proposals in December.) They proposed two sites, according to the Chicago Tribune: one in western Jackson Park, bounded by South Stony Island Avenue to the west, South Cornell Avenue to the east, East 60th Street to the north and East 63rd Street to the south; the other in western Washington Park and 11 acres outside of it, stretching as far west as South Prairie Avenue, and encompassing the Garfield Green Line stop. Both areas include land not owned by the University, which an anonymous source close to the deliberations previously told the Tribune could make the committee “hesitant to commit” to the plans. The sites each measure in excess of 20 acres, but only a fraction of that is slated for the library itself and accompanying structures. Nonetheless some open space advocates have accused the proposal of cannibalizing park land. Charles A. Birnbaum, president of The Cultural Landscape Foundation, penned an op-ed in the Huffington Post lamenting, “we still have to deal with retrograde thinking that views parks as dumping grounds and places to put 'stuff. '” Washington Park, which borders the University of Chicago's Hyde Park campus, was designed by Frederick Law Olmsted and his partner, Calvert Vaux, the designers of New York City's Central Park. But Susan Sher, who is leading the the University of Chicago's library bid, told the Tribune's Melissa Harris it's common for such projects to include existing park space. “When you look at the possibilities and the criteria of having enough space for the legacy of a major historical figure, you can't just plop it in the middle of a shopping center,” she said. 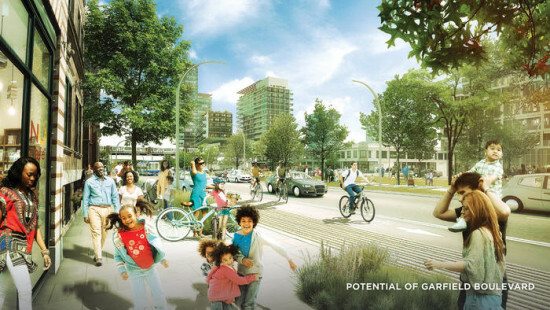 The University's hometown competitor, UIC, proposed a park that would bridge the Eisenhower Expressway, as well as economic development and community resources for underserved West Side areas. While UIC's proposal is more straightforward in its ownership, it also faces obstacles. Illinois' new governor, Republican Bruce Rauner, is expected to appoint a new chancellor of the public university system, which could sow uncertainty about the institution's library plans. Despite the new images and site boundaries, plans for the hotly anticipated library project remain unclear. In addition to selecting a host institution, the library foundation committee will also need to hire an architect, who will ultimately decide on the library's form and exact location. 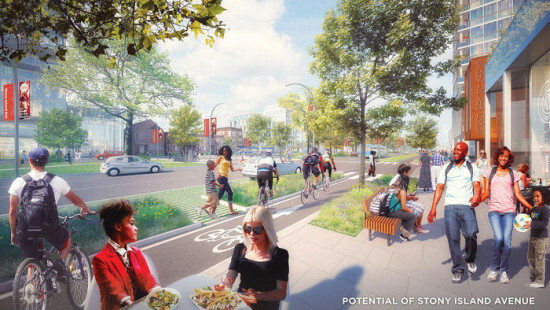 The plans newly made public by the University of Chicago are scant on details for that reason, although they do allude to an "education corridor" along 63rd Street, and a "cultural ribbon" that would connect Washington Park with a "renewed Jackson Park."